Per-terminated cabling is a popular type of termination method that has been used by the overall network designers. It provides an plug-and-play solution for links between switches, servers, patch panels, and zone distribution areas in the data center. Compared to the Fusion splicing, pre-terminated cabling is apparently more suitable to meet the high-bandwidth, high-density network needs. An article entitled “Understanding Pre-Terminated Cabling and Network Deployment” offers some detailed information about the pre-terminated cabling and its advantages. This article will go further to talk about the elements of the pre-terminated cabling including the pre-terminated trunk cables, and plug and play cassettes. Pre-terminated trunking cable assemblies provide an easily installed and cost effective alternative to individual field-terminated channels. There are basically pre-terminated fiber cabling and pre-terminated copper cabling, which will be ntroduced in the following part. Pre-terminated trunk cable usually terminated with MTP/MPO connectors on both ends that provides a quick-to-deploy, scalable solution that improves reliability and reduces installation time and cost. They are capable of supporting multiple users or devices from one point to another while distributing multiple data channels, which is a convenient and economical alternative to running multiple jumpers or fiber cables. Generally 12-fiber MTP/MPO trunk cables and 24-fiber MTP/MPO trunk cables are commonly used separately for 40G applications and 100G applications. The following picture is a 72-fiber female to female MTP trunk cable. There are also high fiber count MTP/MPO trunk cables which have several legs on both ends. The following picture shows a 72-fiber MTP/MPO trunk cable. There are 6 legs on both ends with each leg terminated with a 12-fiber MTP/MPO connectors. Pre-terminated copper cable assemblies including pre-terminated copper trunks and copper patch cords (usually terminated with RJ45 connector), are ideal solutions for data center applications where requires high-efficient deployment. 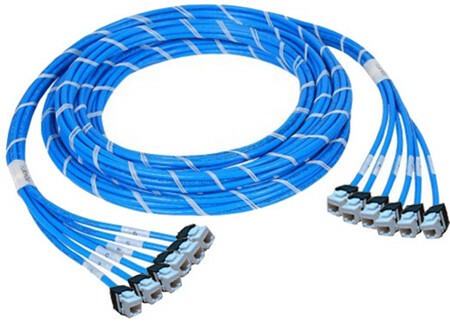 Pre-terminated copper trunk cables are commonly used in point-to-point connections in data centers, such as achieving reliable connectivity between server and switch cabinets. It is a bundle of category cables, built with a choice of 6, 12, or 24 cable bundle and factory terminated with jacks and plugs. The following image shows a jach-to-jack pre-terminated copper trunk cable. With factory pre-terminated and tested parts, the pre-terminated copper cable assemblies can help users save time and reduce waste. In addition, they allow fast and easy installation with reduced labor costs in large copper infrastructures with high-density cross-connection and patching systems. FS.COM’s pre-terminated copper cable assemblies are pre-bundled and pre-labeled styles, available in Cat 5e, Cat 6 and Cat 6a UTP and STP cable constructions in jack to jack, plug to plug and jack to plug termination ends. MTP cassettes are used to break out the 12-fiber MTP connectors terminated on trunk cables into simplex or duplex-style connectors. Simplex and duplex style jumpers can then be used to patch into transceiver terminal equipment ports, patch panels or client ports. The cassette features simplex or duplex port adapters across the front and one or two MTP connector adapters across the back. A factory-installed and tested optical fiber assembly inside the module connects the front adapters to the back MTP connector adapter. Alignment pins are pre-installed in the MTP connector located inside the cassette. 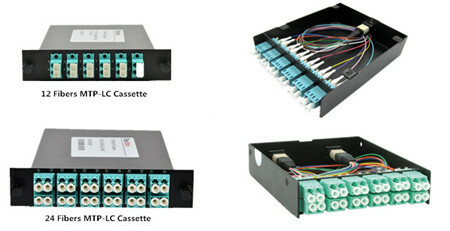 The below image shows the 12-fiber and 24-fiber MTP cassette. Using MTP cassettes provides adaptability for the changing data center environment. Facing technology refresh frequencies of 12-18 months, Plug & Play MTP cassettes used in the data center offer a great advantage. When connector requirements change in the future, simply swap the cassettes whilst leaving the existing backbone infrastructure intact. 12-fiber MTP to LC and 24-fiber MTP to LC cassettes provide a quick and efficient way to deploy up to 12 LC or 24 LC fiber ports in a single module respectively. MTP to LC cassettes are a quick and efficient way of deploying MTP connector breakout. These cassettes provide significant installation savings with no field terminations required. Simply plug-and-play! Pre-terminated cabling is the perfect solution to achieve simple and quick installation. Additionally, the transmission testing of pre-terminated cable assemblies is performed by the manufacturer before shipment, and test reports are included with the assemblies. FS.COM offers a full range of high-quality but low-price pre-terminated cable assemblies. Besides that, we also offer Fiber Taps, J-Hook, Fiber Optic Enclosures, Cable Ties, Fiber Optic Wall Plates, etc. And all of them are tested before shipment. If you have any requirement, please send your request to us.